Will Broadband Be Replaced by 5G? Will we soon be watching Ultra HD video, engaging in virtual reality, and so on via 5G wireless networks? It’s an interesting idea to consider. Many consumers would enjoy cutting the final broadband cord with the cable ISPs. 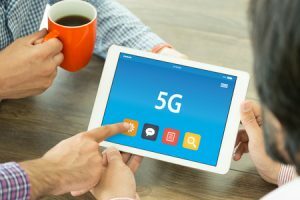 The new 5G wireless broadband networks are on the horizon and it seems they will perform well when compared to wireline alternatives, like DSL, coax and fiber optic. A new report from Datacomm Research indicates that 5G mobile operators will achieve increases in capacity by leveraging millimeter wave spectrum, small cells, and the higher spectral efficiency of 5 — enabling them to successfully compete with fixed broadband service providers. However, it will still require hardware to broadcast a signal so coverage gaps may still be an issue. Capacity will be the most important factor when considering wireless as an alternative to wired broadband. The average household consumes significantly more data per month than the average mobile user today and is likely to multiply over the next decade as Ultra HD video and VR gain traction. But if 5G works out as planned it may offer a more compelling wireless alternative to traditional broadband. A global network that’s available anywhere, while also offering outstanding connection speeds and reliability. If we get to the point where you can purchase a 5G contract that provides incredible speeds and works wherever you go it’d be an easy sell. Superfast global broadband without a fixed line? It’s a compelling proposition.